Question 1: What is Tiberian Dawn : Renegade? Answer: Tiberian Dawn : Renegade is a total conversion based on both the original Command and Conquer : Tiberian Dawn and Command and Conquer : Renegade for Yuri's Revenge assisted by the power and expanded logic contained in Ares. Question 2: Is TD:R just a remake of Tiberian Dawn with Renegade style graphics? Answer: No. TD:R will be introducing many new features such as new infantry units, different gameplay mechanics, and several new underlying features that were not present in Tiberian Dawn. There will also be stylized buildings for each side that are reminiscent of each other, but ultimately have that GDI or Nod feel to them. Question 3: Will you be using anything based purely off of Tiberian Dawn, such as original Nod schemes, original vehicles, etc? Will everything be purely based off of Renegade? Answer: Very little portions of it, and no respectively. There are some vehicles that will be ultimately inspired by both, but most of the inspiration comes from Command and Conquer : Renegade. Certain buildings will have my own personal touch to the design that keeps them true to the original in spirit, but overhauls them for the graphic power that the Yuri's Revenge engine is capable of. For instance, there will be no open cockpit vehicles such as the Buggy or Bike because of the Tiberium infestation. Open cockpit vehicle = empty vehicle with dead driver in the middle of a Tiberium field. 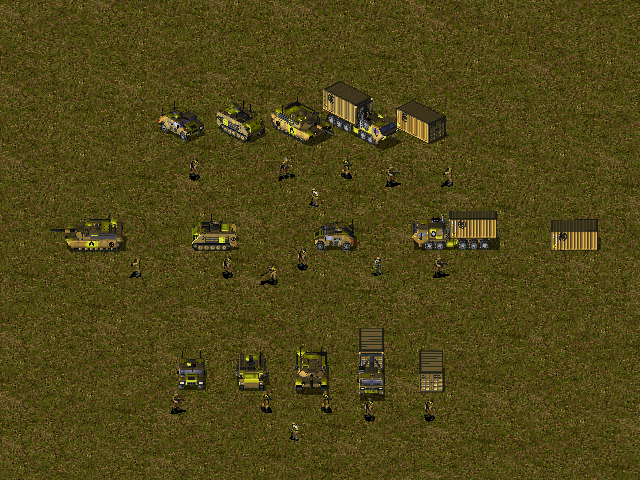 Also, some units that are shared between GDI and Nod, such as the Harvester, MCV, and Chinook will have unique art for them, and we aren't just talking about remaps. Question 4: Will you be remaking any of the original missions from Tiberian Dawn? Answer: Depends. TD:R is based around the idea that the war has progressed and GDI and Nod are at their full strength. I will not be remaking the entire GDI and Nod campaign mission per mission, but some missions that have a soft spot in my heart may sneak their way in, if only in spirit. Especially those missions that give you no MCV and just a team of units. Question 5: Will there be a vanilla mode for skirmishes for people who do not want to use the new units and abilities? Answer: Yes, there will be a "Vanilla" gameplay mode that includes only the original vehicles and infantry, but they will still have the new art style. All of this will be implemented through the mod itself, so two mods will not be released. Question 6: Will there be new theater assets? As far as details to these theaters, I plan on doing what I do best when it comes to assets, and TD:R will have a huge selection of civilian vehicles, infantry, and buildings. TD:R will also have a huge selection of new tiles that were not present in Tiberian Dawn, such as PAVED ROADS and other urban landscape features. That's all for now, tune in regularly for updated information. Question 7: Is TD:R Dead? Question 8: Is this mod WIP?